Republican U.S. Rep. Bruce Poliquin has proposed new restrictions on receiving nutritional aid commonly known as food stamps. Congressional leaders are expected to include Poliquin’s proposals in a massive farm bill being released Thursday. The farm bill, which is due for reauthorization in 2019, covers five years of funding and policy changes in matters involving the U.S. Department of Agriculture, which has overseen the food stamps program since its inception. The proposed changes to the Supplemental Nutrition Assistance Program — which with related federal nutrition programs is worth about $70 billion annually — have already been identified by some as the flashpoint in the overall debate. Poliquin’s proposals include two major changes to SNAP, the formal name for the food stamps program, through what is referred to as the Food Stamp Integrity Act, which is modeled after changes to the program that have been enacted in Maine. The changes impose a ban on SNAP for anyone who is delinquent in paying child support — unless they have an approved payment plan — and add new work requirements. The proposed work requirements mandate that “able-bodied adults with no dependents” work, volunteer or train for work for at least 20 hours a week to receive SNAP benefits. Failure to do so for three months in a 48-month period would result in ineligibility for the remainder of the four years, or until the recipient complies. The limit under current law is three months in a 36-month period, according to Poliquin. The proposal would also limit states’ authority to waive work requirements for recipients. Poliquin said Thursday that he doesn’t view his proposals as funding cuts, but rather prods to push people toward independence. Poliquin said the new farm bill proposes the same level of funding for SNAP as the current one, but if the provision allowing states to divert money to job training passes, it would reduce the amount of food stamps directly to recipients. Poliquin did not offer an estimate for how much money would be diverted. He also said enforcement of the new rules would fall on the Maine Department of Health and Human Services — but there is no money specifically earmarked for the cost of that. — A requirement for a face-to-face interview for replacement of an EBT card after two have already been replaced. The proposal includes language that a new card can be denied after the issuance of four cards to one person in a 12-month period. — Permanent disqualification for anyone convicted of SNAP fraud or defrauding any government agency. 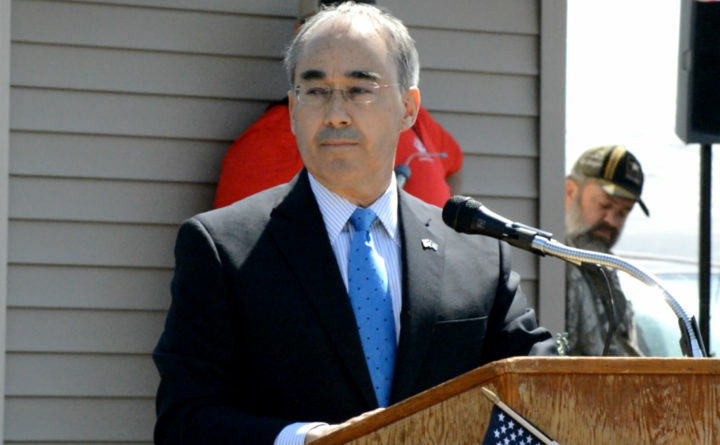 Under current law, a fraud finding results in a one-year ban, according to Poliquin. — Permanent disqualification from receiving SNAP benefits for anyone who has been convicted of drug trafficking. Poliquin is also expecting another proposal, his Fruit and Vegetable Access for Children Act, to be included in the farm bill. The proposal would allow schools to use USDA funding to purchase additional forms of fruits and vegetables, such as frozen, canned and dried. Poliquin argues that the proposal will “maximize the value of program dollars” by easing current requirements for fresh fruits and vegetables for low-income students who receive food subsidies at school. Poliquin argued that it will help local farmers year-round and stretch funding for school lunch budgets and avoid situations where, for example, Maine schools are paying premium prices for fresh strawberries in the middle of winter. But U.S. Rep. Chellie Pingree, a Democrat who represents Maine’s other congressional district, criticized the proposals.